During the early years of the Troubles the Provisional IRA wreaked havoc upon Castlederg town centre in a fiercely relentless bombing campaign. Dozens of attacks were carried out using homemade bombs regardless of the risks to the general public who lived and traded there, or to the security forces or emergency services personnel who would be called to any bomb alert or its aftermath. The most concerted terrorist bombing mission in Castlederg’s beleaguered history was staged 40 years ago this month, when an armed gang of six IRA terrorists planted five homemade bombs in and around John Street. There was no prospect of the security forces being able to disarm so many devices or evacuate the area. Four of the bombs exploded within a 23-minute period and as a result property in the vicinity was decimated. There were many lucky escapes from injury that night and miraculously there were no fatalities. But the Provos’ blitz of Castlederg on 14th November 1978 drew much criticism, including from the Roman Catholic Bishop of Derry Edward Daly who had served as a curate there. When he visited the town during the weekend after the bombings he called for the IRA to stop bombing Castlederg. Remarkably the terrorists appeared to take heed of the bishop’s intervention. After around 80 attacks throughout the previous eight years, the IRA largely ceased bombing the town’s commercial heart. The terrorists then switched their primary focus to targeted gun and bomb attacks on members of the security forces at home or work. Throughout their violent campaign, republicans murdered more than 30 people who were from, lived or worked in Castlederg and its rural hinterland. One of the their first victims was a Roman Catholic; he was shot dead alongside his Protestant work colleague, who had been his sergeant when he served in the UDR. Another early 1970s victim was an atheist bomb disposal officer, killed as he attempted to disarm an IRA device abandoned close to a church. The remainder of those slain by republicans in Castlederg were from the local Protestant community. They included the first UDR soldier and the 100th (and then youngest) RUC officer to be murdered, as well as a grandmother and a UDR Greenfinch. The IRA killed young men starting out in life and grandfathers on the brink of retirement. They shot fathers in front of their sons and killed sons in front of their mothers. They ambushed family men going to work in the morning and young men coming home from a night out with friends. They hid bombs beside the bodies of their victims and phoned parents to gloat at the murder of their child. Castlederg’s story isn’t unique, but the unionist community there suffered enormously at the hands of the IRA. Each murder or bombing prompted calls for tougher security and a crackdown on the terrorists. After any ensuing surge in security force activity had faded, the inevitable “next attack” followed. A seemingly unbreakable sequence of violence and horror continued. The fact that 95% of murders linked by motive and tactics, carried out in a small town in a short period of time remain unsolved is a cataclysmic failure of the criminal justice system. A key reason for the IRA’s ability to wage such an incessant and deadly terror campaign in the area was its border with the Republic of Ireland. Some 50 miles of the west Ulster frontier, extending from Claudy outside Strabane to Belleek in Co Fermanagh, was devoid of permanent security infrastructure. This and the myriad of unapproved border crossings, officially closed but often passable, created a huge tactical advantage for the terrorists. IRA gangs were able to come and go as they pleased, launching deadly attacks in Northern Ireland before melting into the safety of sympathisers’ houses in the Republic. In that “safe haven” they were also able to build bombs, store weapons, train and rest up, largely because of the indifferent attitude of successive Irish governments to the issue of border security. This is demonstrated not only through the permeable nature of security on the Republic’s side of the border, but also by the Irish constitutional position on extradition and the arms crisis involving Irish cabinet ministers. It’s easy to see why the vast majority of IRA gun and bomb attacks on targets in the Castlederg area could emanate from or conclude in the jurisdiction of the Irish Republic. But in one particular case the role of the Irish state in facilitating IRA terrorism in Castlederg was even more pronounced. On April 13 1991 IRA gunmen murdered 23-year-old Protestant civilian Ian Sproule outside his home near Killen. An outcry ensued, claiming the IRA was engaged in a nakedly sectarian offensive in the area. IRA representatives countered by producing a Garda Siochana security document to the press alleging Mr Sproule had been murdered because he had loyalist paramilitary connections — something the family and their clergy refuted. An official Irish government investigation followed into how the IRA had obtained the secret Garda file, but the specific findings have never been shared with Mr Sproule’s family. Like so many Castlederg families, the Sproules want truth and justice for their brother and have met Irish government officials seeking sight of the report, but their wishes have been denied. Requests to meet the Irish Justice minister and the Taoiseach have been deflected or ignored, and the Garda Ombudsman has yet to rule on a formal complaint made via South East Fermanagh Foundation and Derg Valley Victims’ Voice in September 2017. Whilst former British soldiers are being pursued in relation to allegations about misconduct during their service here, there is no similar examination of the role of the Irish state involvement in the Troubles. This included negligence that eased the IRA’s ability to conduct terrorist operations and thereby prolonged the violence, as well as active assistance that created victims and that continues to deny justice to this day. 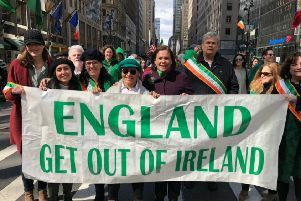 It is clear the relationship between the Irish state and the modern IRA is persistently overlooked in analysis of legacy issues and it deserves much greater attention than it has been afforded. The NIO’s legacy consultation does little to inspire confidence such matters will be addressed with any adequacy any time in the near future.